Visit Janet Granger's new Etsy shop!! You now have the choice of viewing the miniature needlepoint kits on Janet Granger's main website, www.janetgranger.co.uk, or her NEW Etsy shop, 'Dollhouse Embroidery'! 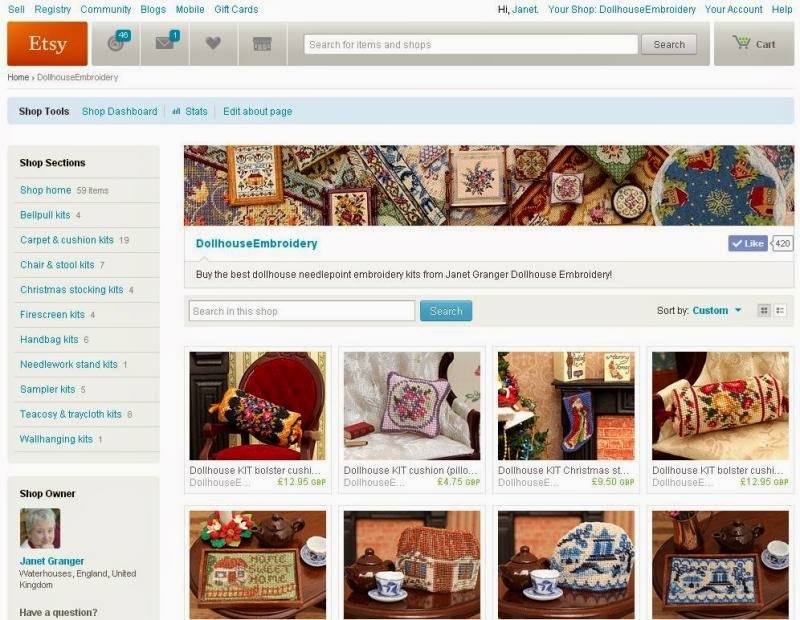 If you are not familiar with Etsy, it is a web portal similar to Ebay, where sellers set up 'shops' which are all craft-based. - There is the facility to save items you like to your 'Favourites' list, so you can use the Etsy shop to compile your own wish list of things you might want to buy later, to save you searching for items again at a later date. This facility isn't possible yet on the main www.janetgranger.co.uk website. - Etsy allows each product to have five different image views, so you can see each item as a close-up (stitched), in a room-setting, as an 'exploded kit' (that is, with all the contents spread out clearly in one picture), the front of the packet, and the reverse of the packet, so that you can see exactly what you will receive once you purchase it. - Every kit shown is in stock and ready to go, just like on the main website, and kit prices are the same as the main website. If you would like to, please 'Favourite' the shop and tell your friends about it! Janet would be very interested to hear any feedback from you about the new Etsy shop, so please email her at janet@janetgranger.co.uk with your comments.